You just gave Wayward Vagabond one Fear Candy. Lythiaren must be very proud of you now! Be sure and come back again tomorrow to feed this creature. 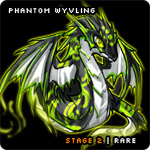 Add this pet to your wishlist!